The Showbiz XI were a charity celebrity football team set up in the 1950s and over the years raised a lot money for good causes by arranging soccer matches and associated events throughout Britain. However not content with having a second career as would-be football players, the so-called celebs also opted for a third career as would-be singers - with dubious results. There were two Showbiz XI albums issued in 1989 and 1990 with some songs appearing on both. I have chosen the 11 best songs, which, to be brutal, are pretty bad. A lot of the blame must go to team leader/manager Jess Conrad. He was a teen idol of the early 1960s and was never much of a singer, opting to sing some very wet songs. No less than three ended up on Kenny Everett's Worlds Worst Record Show on radio in 1977. 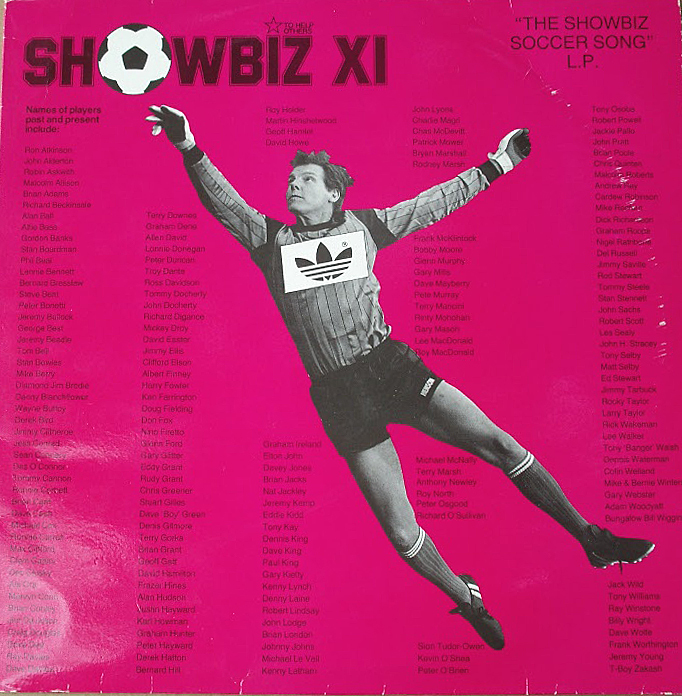 The front of the sleeve shows Jess in football gear saving a goal but musically scoring an own goal in the process. His three contributions are let down by his leaden, tuneless singing and, again, a bizarre choice of material. Jesus The Messiah is a frankly embarrassing ode to Christ, which would be rejected from the most open-minded Christian album. Black Stockings is a Lovely Rita-style ode to female traffic wardens and sees Jess attempting a rap and falling flat on his face. But the worst offender is Soccer Superstar, a plodding jazz-funk dirge to football stardom with an all-time bad opening line: "Passing, kicking, shooting, dribbling, tackling, heading and ball control" sung by Jess and fellow vocalist Tanya Tenola with flat delivery and very little enthusiasm. The first time I played this I thought the record was pressed off-centre. It isn't! A giggle is Steve Bent's seemingly helium-enhanced Country and Western Cowboy that has about as much to do with cowboy spurs as the Showbix XI have in common with Spurs FC. But save room for Why Did They Take Heaven? by Denis Gilmore and Lee MacDonald. This is truly toe-curling. They half talk/sing as father and son with the quizzical kid asking questions about nature and the environment with dad putting him right. Lee MacDonald was a child actor who played Zammo Maguire in the hit kids drama Grange Hill. But he's no singer and even has trouble speaking in time to the music. "Is it true you drink rain water? Were there fishes in the sea? And other life in the world apart from you and me?" he says in staccato as though he were being slowly electrocuted. Denis Gilmore as 'dad' is even worse, being so wooden he's giving off splinters. The second album was a misguided a tribute to America and Hollywood hence the dire John Wayne song, a tuneless tribute to model/actress Dorothy Stratten and the truly bad Indian Brave by Robert Scott which boasts 'special backing vocals by Ala Cra, Glenn Ford, Geoff Galt and Brian Grant'. This must have put Anglo-American relations back by decades. Don't worry if you're outside Britain and haven't heard of most of the names singing here, we haven't heard of them either! The front of the sleeve lists more famous names, who were seemingly supporters of the team, but wisely opted not to contribute to the project (they knew their limitations). The main problem here is that because it was for charity it gave them an excuse to get away with such mediocrity. But why are so many charity records a by-word for crap? The small print reveals that the Patron of the Showbiz XI was one Margaret Thatcher (Britain's former Prime Minister) and suddenly it all makes sense. She spent her life inflicting pain and misery on her populate and so was more than happy to put her name to more of the same with these albums. Date: Produced by Allen David and Jess Conrad. Killer! Jess Conrad is King! The Nasty Eighties keyboard sounds, the really bad drum machine sounds and even worse fills just add to the tooth grinding specialness of this album. God this is bad. Thanks for this. At least Conrad understands the importance of ball control. Bent's track is no "Going to Spain," but I do like how he rhymes 'cowboy' with 'cows, boy'. Wow. I thought I was onto a bad thing when I spied these albums in a Brighton charity shop. How happy I am to know that I wasn't wrong. It is good to know that part of my vinyl collection has been given WFMU-worthy status.